29 December 2008: Though external perceptions are largely moulded by the continuing divide between it and its Communist neighbour in the north, the Republic of Korea is highly urbanised and possesses a well-developed system of local government based on both history and utility. However, reform is very much on the agenda, with moves to replace the current three-tiered structure with a city-orientated two-tier system. Modern politics in South Korea have understandably developed under the shadow of its hostile neighbour and former constituent part in the north, though it finds itself today as a stable liberal democracy and respected actor in East Asia. Following the end of the Korean war in 1953, Syngman Rhee’s regime remained in place, having taken over from the US occupying forces on the southern half of the Korean peninsula. Having avoided removal from power by protests in 1960, Rhee’s authoritarian regime was replaced by a short-lived government under the auspices of Yun Po Sun’s Democratic Party, who was himself removed by a military coup the following year. Major-General Park Chung Hee then remained military ruler until his assassination in 1979. Park’s still controversial period of office was marked by rapid economic growth and the resumption of normal diplomatic relations with neighbouring Japan. The subsequent military regime of Chun Doo-hwan, remembered for the military crackdown against student protestors leading to the Gawngju massacre in 1980, remained in place until the resumption of democratic rule in 1987. Today, the Republic of Korea is a liberal democracy governed by an executive president elected by the popular vote every five years and a unicameral 299-member National Assembly elected by proportional representation every four years. Taken at the most primitive level of consideration, South Korea is divided into nine provinces (‘do’), which are then divided into counties (‘gun’). However, the weighting system designed to recognise large urban centres has reorganised this system into an array of units, with six metropolitan cities (‘gwangyeoksi’) such as Busan (the largest other than the capital Seoul) and ordinary cities (‘si’) which are counties which have attained a population of 150,000 or more. The three cities with more than 500,000 inhabitants are then divided into wards (‘gu’), the rest into neighbourhood areas (‘dong’). The counties outside of the urban conurbations are subdivided into either towns (‘eup’) or districts (‘myeon’), with towns having 20,000 or more inhabitants. Both towns and districts are subdivided into villages (‘ri’). South Korea has only one special city (‘teukbyeolsi’), the capital Seoul, which is then itself divided into 25 wards and a further 522 neighbourhoods. The wards became autonomous in 1988 and have elected their own mayors since 1995. 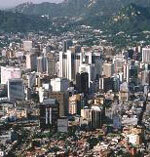 The metropolitan area of Seoul contains 10.3m people and is ranked 22nd most densely populated in the world. The South Korean government has announced plans to relocate the capital outside of the city of Seoul but this has been the matter of considerable controversy and a Supreme Court ruling has declared it unconstitutional. The Seoul Metropolitan Government is based on the office of the elected Mayor, who is currently Oh Se-hoon, elected in 2006. The mayor appoints three vice mayors to supervise the city administration, as well several assistant mayors. The legislative branch consists of the 104-member Metropolitan Council, elected every four years.